One resource that is often overlooked is rest or lying time. To maximize production dairy cows require at least 12 hour a day of lying time. Lying increases blood flow through to the mammary gland which is associated with increased milk yield. In addition, inadequate rest is associated with increased lameness which greatly decreases production efficiency. Three key factors that influence lying time are stall design, lameness, and bedding. Many publications have general recommendations for stall width, length, and neck rail height; however the lying surface may have a greater impact on increasing lying times. 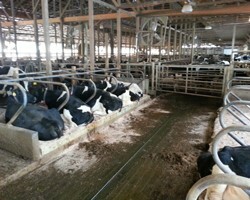 Many producers are aware that sand bedded stalls improve lying times; however they may not have the will or capacity to deal with sand as a bedding source. What you may not realize is that lying times can be improved on mattresses if excessive bedding is used. Unfortunately, the amount of bedding required to increase lying times is in excess of 16 pounds of bedding per stall. Using this amount of bedding in a traditional mattress stall would be expensive over time. To overcome this some producers have tried using PVC piping as bedding savers with marginal success. A more successful alternative would be retrofitting a 4x6 piece of lumber, similar to a railroad tie, to the back of the existing stall bed. This can be done by drilling two holes through the lumber and attaching it to the concrete base with rebar. As long as the step up into the stall is less than 16 inches cows seem to have no problem getting in and out of the stalls. It also helps if both edges of the lumber are rounded to facilitate entering and exiting of the stall. Moreover this retrofit allows for each stall to maintain 6 inches of bedding material, creating a deep bedded pack that can improve lying times. In addition, the 4x6 piece of lumber acts as a bedding saver reducing the amount of bedding needed once the stalls have been filled. Fresh bedding can be added to the front of the stalls and gradually worked towards the rear of the stall, providing cows with a large amount of cushioning around their knees when lying down. This also maximizes the use out of the bedding as the rear of the stall is more likely to be soiled. The other benefit is that because this retrofit can be done quickly and cheaply, meaning it can be a temporary solution prior to a larger renovation or it can be maintained on a more permanent basis. Moreover, this retrofit can be successful with multiple bedding sources including sawdust, Syracuse fiber, or even sand which provides flexibility for producers to source different bedding in the future. On a recent case study stalls were retrofitted in the manner described. The retrofitted stalls were both too narrow and too short for their cows. The farm retrofitted a small section of stalls to determine if the cows actually preferred the retrofitted stalls. Within a week to cows showed a preference for the retrofitted stalls, with all the retrofitted stalls being used and cows lying down. The farm is now retrofitting all the remaining stalls. The improved lying times should result in an increase in milk production. This may be something to consider if cow comfort presents a challenge on your farm.